The U.S. Department of Agriculture (USDA) is giving advice to grandparents on how they can get their grandkids to eat healthier, including instructions to give them "hugs" instead of treats, and read government bedtime stories. 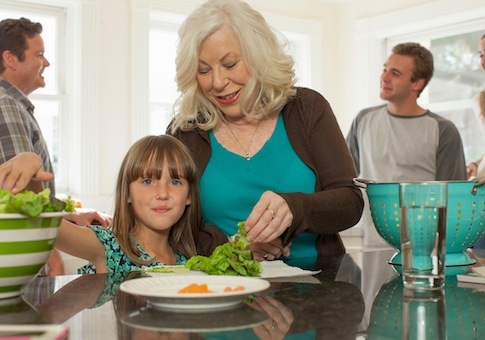 "Take time to share and listen to your grandchild—the time you spend together offers wonderful opportunities to understand one another," a USDA blog post entitled, "Grandparents Help Kids Develop Good Eating Habits," said on Monday. "Discuss likes and dislikes of different foods and talk about what they eat at school or at home," the agency said. "Involve grandkids in selecting and preparing foods for meals, and offer the same foods to everyone. Avoid making different dishes to please young, fussy eaters." The USDA then tells grandma to serve her grandchildren baby carrots, applesauce, and string cheese to "meet their daily food group needs." "Reward them with your attention," the USDA said. "Hugs are much better than sweet treats." The department also directed grandparents to read government bedtime stories to "show how much they love and care about their grandchildren." "Show your grandchild games, activity sheets, and other fun ways to learn about good nutrition at My Plate Kids’ Place," the USDA said. "For a bedtime story, read The Two Bite Club." "The Two Bite Club," which is available in English and Spanish, is a USDA "educational storybook" about a family of cats that uses government charts to determine its food intake. The story encourages children to try two bites of foods in the USDA’s "My Plate" food diagram. After trying broccoli, yellow apples, low-fat yogurt, and "hard-cooked" eggs, the children in the story get certificates of participation. "I am so proud of myself. I tried some new foods and I learned about My Plate," a cat says at the end of the story. The book also includes activities in the back and tips for parents on "growing healthy eaters," such as avoid "placing a television set in their child’s bedroom." Other tips include: "Family meals are important for everyone. Eat at a table. During mealtime, turn off the TV and your phone," and "Skip the urge to offer a snack to quiet tears or reward behavior … These practices can lead to emotional overeating later on," the USDA said. The Monday blog post, which was written by Patricia Britten, a nutritionist at the USDA’s Center for Nutrition Policy and Promotion (CNPP), also advised grandparents to take their grandchildren to farmer’s markets and "talk about the choices you are making." "Help them learn cooking skills, which will benefit them throughout their lives," the blog said. "Encourage them to be active throughout the day." The CNPP had a proposed budget of $8.7 million in fiscal year 2013, which Rajen Anand, the executive director, said would allow the office to enhance "cutting-edge web-based systems designed to empower consumers" and "foster behavioral changes toward positive dietary practices and active lifestyle." This entry was posted in Issues and tagged USDA. Bookmark the permalink.